I tell you folks its infatuation and it can easily come in fast like passing to a fast food drive-thru. If it’s genuine love it takes time, it grows in time. Love is grown out of the appraisal of all the known characteristic of the other person…good or not. Infatuation can only arise out of acquaintance, with only a few of only one of their characteristics. I can’t love someone that I don’t really know; I can’t love someone from a distance. I can’t love someone based on external appearance. I can’t love someone unless I have a genuine knowledge of who they really are. Are they as real out there with the people when they are not trying to impress you? I can’t love someone unless I have a genuine knowledge of what they like, their character, their values, their history, how they relate. Because you don’t love an object you love a person and genuine love is based on a genuine knowledge of that person. What are they really like? Love is other person centered, it is outgoing, it result in sharing. When you really love someone, your focus is on them, your focus is on other people. You really care. Infatuation is self centered. It is self – focused. Genuine love is centered on one person only, while infatuation maybe in love with two or more persons simultaneously. I remember the story of a guy who is a part of a basketball team where they would travel to countries to compete, He met a lady from Chile and they started going out and spending time with each other, then all of a sudden he said to himself I’m in love. And so they have to go to Peru for the next game then right across their bench sit a very awesome girl with big brown eyes, long black hair shining. And so he sat beside her and after that game he approached this girl, then the next thing you know she has her arm on the guys arm. Then he realized he had a problem, He is in love with the girl from Chile and Peru. And they have been to eight countries and He’s in love with six of them…. You know what that guy realized, He didn’t have a clue of what real Love was. You can be infatuated with as many people but you can only be really in love with One. Someone said 30 to 50 points of your I.Q. drops when you’re infatuated. The chemicals in your body keeps kicking in and you get a little infatuated and the rest is history. It tends to have a sense of security and feeling of trust, after considering everything involved in the relationship with the other person. Infatuation can have no sense of assurance, like a “maybe one day she say Yes”, can have a blind sense of security based upon wishful thinking rather than upon careful considerations. If you’re jealous of we’re that guy most of the time and who does he spend most of his time. There’s a sense of insecurity? Watch out because that might be just an infatuation. An individual in love works for the other person or for their mutual benefit. He or She would study well to make the other person proud of him/her. When you’re in love and you’re committed you work for one another. His interests, his everyday affairs, he often daydream, which becomes substitutes for reality. And that individual starts to live in the world of dreams. You may daydream but those dreams are reasonably attainable. I even remembered a friend who was planning to leave our church and be with his new found friend’s church, he said he was ready to leave everything for that person, leave his calling and all that… When it’s day dreamy and over the top of our heads, rest assured that its infatuation. It’s not love. A couple in love they face problem frankly, and they tend to solve the problem/s. If they are barriers they are facing, these barriers are approached intelligently and removed. Infatuated people tend to disregard it and just gloss-over. No common vision, you don’t know him, no common commitment. Here what how it was said “I understand all the reason why it work but we’re IN-LOVE!” it’s called denial. Tend to be constant while infatuation often varies with the distance between the couple. We’re you more in love with that person after 7 weeks being apart from her or does it vary along the way? It not just about emotions, not just about chemicals but about what God is doing in your heart concerning that person even though you we’re both far away from each other. How about in your relationship? If distance strengthens it probably it’s love. If pretty soon your eyes are wandering, and you look in other places probably it infatuation. It should be the smaller fraction of the total relationship when a couple’s in love. And there’s relatively greater part when you’re infatuated. When a couple’s in love any physical contact they have tends to have meaning as well as being a pleasurably experience in itself. It tends to express what they feel in other words their commitment, their concern that’s real for one another. Infatuation however, physical contact tends to be an end in itself. It represents only pleasurably experience. When it is love there is restrain and respect. When you decide to hold a hand that means the relationship goes from casual to the next level and there’s a commitment there. In love, an expression of affection tends to come relatively late. It because you really want to get to know that person, not that it is bad, it great. You do want to think not just your emotions and your hormones but with your mind. You slow it up and let the affection come later on in the relationship. 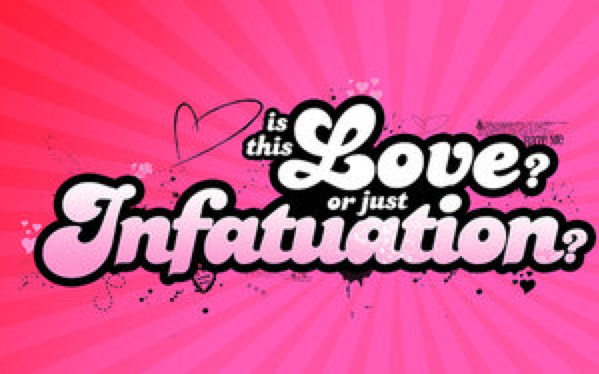 Infatuation may come earlier sometimes from the very beginning remember those dating shows, those reality dating shows? You know what happens in those? Almost always it is physical, and you what the message is… “That’s how you do relationships”, the message of the media is, relationships are all about being a hottie, having the right body, being attracted, getting the chemical juices up, getting together and then trying to figure out if there’s maybe something more to this. It’s infatuation it’s not love, and your gonna get your heart broken again, again, again and again. Love tends to endure. Infatuation may change suddenly and unpredictably. A couple in love is not indifferent to the effects of postponement, whether it be a wedding or any major event. They don’t prolong that period unless they found it wiser to wait. They don’t feel an almost irresistible drive towards haste. In contrast Infatuated tends to feel an urge towards getting married. Postponement is intolerable to them. They interpret it as a Depravation rather than Preparation. When you love another person, you can wait. Remember Jacob and Rachel? He waited seven turns out to be 14 years…and the scriptures says it was like a day, why? It’s because He loved her, He cherished her, He loved her. A couple “in love” is not indifferent to the effects of postponement, whether it be a wedding or any major event. They don’t prolong that period unless they found it wiser to wait. They don’t feel an almost irresistible drive towards haste. In contrast Infatuated tends to feel an urge towards getting married. Postponement is intolerable to them. They interpret it as a Depravation rather than Preparation. When you love another person, you can wait. Remember Jacob and Rachel? He waited seven turns out to be 14 years…and the scriptures says it was like a day, why? It’s because He loved her, He cherished her, He loved her.